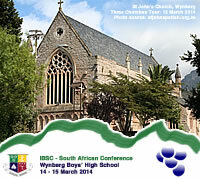 Steeped in history, Wynberg Boys’ High School has undertaken a large amount of research and fact-finding with regards to the area in which we find ourselves. Surrounded by famous Churches and buildings, the schools own history is full of interesting tales. 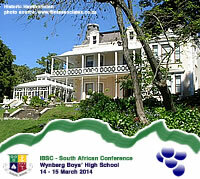 Eager to share our history with the world, Wynberg is continually developing its own Museum and building towards our 175th celebrations in 2016. 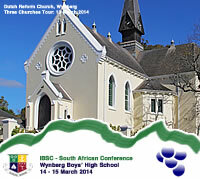 In doing, we have developed two sets of Historical Wynberg Tours; both of which were on offer to delegates this week – the ‘Three Churches Tour’ and the ‘Three Great Houses Tour.’ The truly fascinating aspects of these six beautiful buildings is that they all lie within a kilometre or so of Wynberg Boys’ High School. Church number two is the Dutch Reformed Church, sited in a commanding position on Carr Hill and now a national monument. Dr Philip Eduard Faure was the first incumbent, appointed in 1854 and remaining at his post for the next 48 years. Successively enlarged over the years, its last extension was completed in 1899 and owed a significant debt to Cecil John Rhodes who provided the four massive granite pillars which were part of this enlargement. be shown in this grand, High Victorian country-house, bought in 1892 by Sir JB Robinson, the well-known South African mining magnate. The second building of significance is the great Edwardian mansion, ‘Trovato House,’ designed by Sir Herbert Baker for the Transvaal millionaire, Carl Jeppe in 1903. Once surrounded by many acres of farmland, ‘Trovato’ passed from the Powell family to its present use as headquarters of a commercial enterprise which assures its immaculate present-day condition. gradually been replaced by sports facilities and new school buildings. 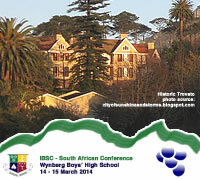 Post by IBSC SA Conference.